How old is Thomas The Tank Engine? Not Thomas The Tank Engine the brand, but Thomas The Tank Engine the person trapped in a train's body. Do you know? Does Google? Does anyone? Not a soul. Or, to be more accurate, no one KNEW. Because thanks to Microsoft's How-Old tool we can finally find out. Literally everyone else on the internet has done it, why not Thomas and friends? Not only have we learned that Thomas is a 15-year-old trapped in a 27-year-old engine, we have also uncovered the truth about his gender: the really useful engine is, in fact, a woman. If you'd asked us, we'd have said that Percy was about 11. After all, this is the train who ran away backwards without a driver because he got in Gordon's way for a moment. Come on Percy. Sort yourself out, you're supposedly a grown up. Edward was always kind of like the hot older brother, in so much as anthropomorphised trains can be attractive to anyone, so we are disappointed to discover that he's actually 45 and, er, a woman. Now this is more like it - Henry is definitely about 47. He's got just enough responsibility to be worried all the time and is therefore always nagging you to stop messing around and sort your life out. "Where do you want to be in five years, Kate?" he'd probably ask. "Still writing silly articles about toy trains on the internet? Is that really what you want your life's work to be?" Typical 47-year-old, that one. Gordon's like the scary teacher at school who's always shouting so when you're little, you hate them. But then you get a bit older and you start realising that they're quite witty and any word of praise from them is worth five gold stars from any other teacher. All scary teachers seem about 66 when you're a kid. He's probably only 32. If Edward was your friend's hot older brother, James was your annoying brother who wouldn't stop hitting on your friends. 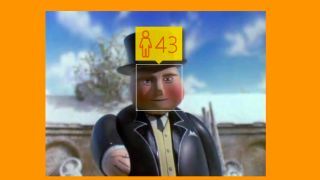 Microsoft pegs him at 36 - he's probably still living in the Fat Controller's basement. Toby is the nicest of all the engines. He's 38 and he's got it all figured out; he's not trying to impress any of the younger engines anymore, he's just getting on with his quiet, closeted life up on the mountain where we think he lives? Not sure. Anyway, he's also a woman. Right, well, something has clearly gone wrong with Microsoft's algorithm because Donald and Douglas are very clearly twins. Also, what is it trying to say here: if you're happy, you're young but if you look a bit concerned you are old? Ugh. The patriarchy strikes again.